During the last several months I have become more and more aware of how many animal patterns are shown in home decorating magazines. Recently there was a photo of two Zebra pillows on a bed of white linens on an antique dark brown four poster. Simply stunning! it looked both very contemporary and yet traditional. 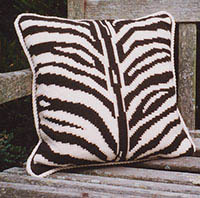 It reminded me of the Zebra pillow in my cross-point™ collection which is available either pre-drawn or only for counting. This 3 color pattern is also available as shoulder bag, eyeglass case or upholstery by the square inch as shown on the stool top at right. 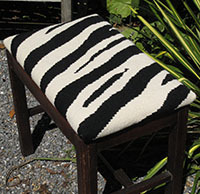 The beauty of animal patterns is that they go with everything as they have long been considered “neutral”. Exotic animal skins have been used by humans throughout history. They occur in coats of arms, zodiac signs, as national animals. throughout literature, and feature prominently in mythology and folk lore around the world. From maharajas to princes, from tribal chiefs to movie stars, animal skins have decorated bodies and interiors to show wealth and status. Hunted to near extinction, our patterns are our “green” answer as we showcase these fabulous natural designs in stitched pillows, rugs and upholstery. Below are two more options in animal patterns from the cross-point™ pattern page: Pony (pillow, rug, upholstery) and Tiger (Pillow, small upholstery). For stitchers who love to count, our Leopard pattern as pillow or eyeglass case is also available in either two or three wool colors. Pony Pillow & Upholstery and Tiger patterns. This entry was posted in cross-point Color Schemes, cross-point kits, Historic Textile Patterns and tagged About cross-point, Animal Patterns, animal skin patterns, animal skins, color schemes for stitching, cross stitch kits, cross-point, crosspoint kits, Interior Design, needlepoint kits, neutral colors, pillow, SDA, upholstery designs. Bookmark the permalink.